In the previous tutorial we've seen how to convert, load and display a model with LibGDX. Now we're going to take a look at how to load a complete 3D scene. We use the same code a before as our base, although I've renamed the class to SceneTest to keep things clean. In that class we have an array of ModelInstance instances, which we will use to define the scene. We already have seen how to load the ship model, so let's add a few more models. You can download the models I've used over here. It contains 4 models (obj files): the ship model we used previously, the invader.obj and block.obj models from gdx-invaders and a spacesphere model I quickly put together. The space sphere is simply a large sphere with a texture on it and reversed normals (so the texture is visible from the inside). Here we added an array to hold our blocks and invaders. And a single ModelInstance for the ship and space. We will still use the instances array for rendering, but this also allows us to easily access each part of the scene. So, if we want to move the ship, we can just use the ship instance. We set the camera to a location more suitable for the scene we are going to load. And next we tell the assetmanager to load all the models. Now here is where things are becoming interesting. On the first line we fetch the ship model and create the ship ModelInstance from it. On the next line we rotate it 180 degrees, so it is facing away from the camera and then move it on the Z axis towards the camera by 6 units. Finally on the third line we add the ship to the instances array, so it will actually be rendered. Next we do the same for the block and invader models. But now instead of creating just one instance we create multiple instances. The block instances will be aligned in a row on the x axis and we add them to both the instances and the blocks array. Again, this is just for easy access, so we can e.g. check if ship collides a block. 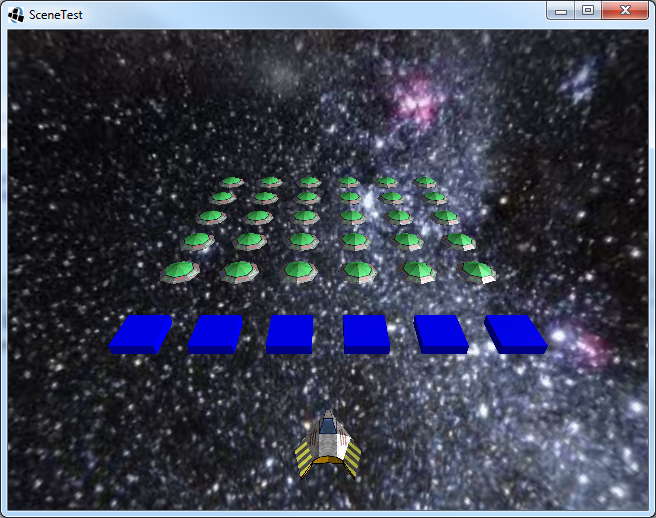 The invader instances will be placed on a grid on the XZ plane. In the render method we render the instances just like before. But now we also separately render the space instance and apply no lights. We need to check if space is set before we do that, because it is loaded asynchronous. Well, that's quite nice. We could now just implement some gameplay and call it a day. In fact, I bet there are quite a few games out there that are created this way. But that will not work for bigger scenes, so let's optimize it. First of, we load four models and in a bigger scene you would likely be loading much more models. Let's optimize that. I enabled X-ray for easy editing, that's why the models look transparent. In the background you see the space sphere, which I called "space". In the front you see the "ship", "block" and "invader" models blended into each other, because they are all set at position (0,0,0). 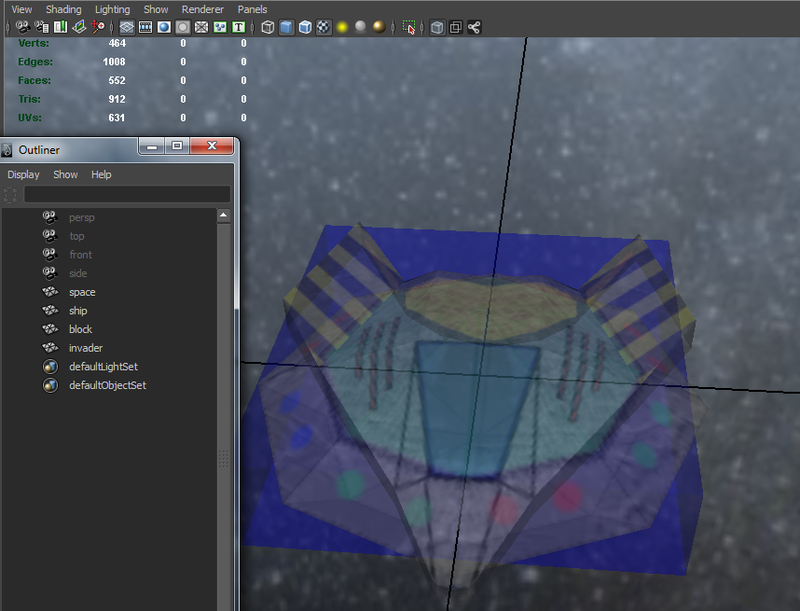 If all models look correct and have the correct name, you can export the scene to FBX, I named it "invaders.fbx". You might also want to save the scene in the modeling application's own format, we're going to need it later on. If you want to see all command line options, you can run fbx-conv without arguments. In the create() method we removed the loading of each individual model and replaced it by the single model invaders.g3db. In the doneLoading() method we fetch that model from the assetmanager. And when creating the ModelInstances we supply that model and the name we used when creating the FBX. So e.g. for the ship ModelInstance we are telling ModelInstance to only represent the model called "ship". Ofcourse the name provided to the ModelInstance must exactly match the name you gave the model in the FBX. We will get deeper into this later, but for now let's run it and see that it's exactly the same as before. Well that's useful. We can provide all models we need for a scene in a single file. Even more, because we now have a single Model, the ModelInstances share resources. This allows ModelBatch to make optimizations for performance (more on that later). Of course you can still use multiple files if needed, in fact sometimes (e.g. with skinned or animated models) it's easier to have them as a separate file. But there's more. Let's go back to the modeling application and make sure we have the same scene open as we created before. Now grab the ship model, rotate it 180 degrees around it's Y axis and translate it 6 units along the Z axis. Just like we did in Java code. Next grab the block model and translate it 3 units on Z and -5 on X, then rename "block" to "block1". Now grab the invader model and translate it -5 units on the X axis and rename it to "invader1". 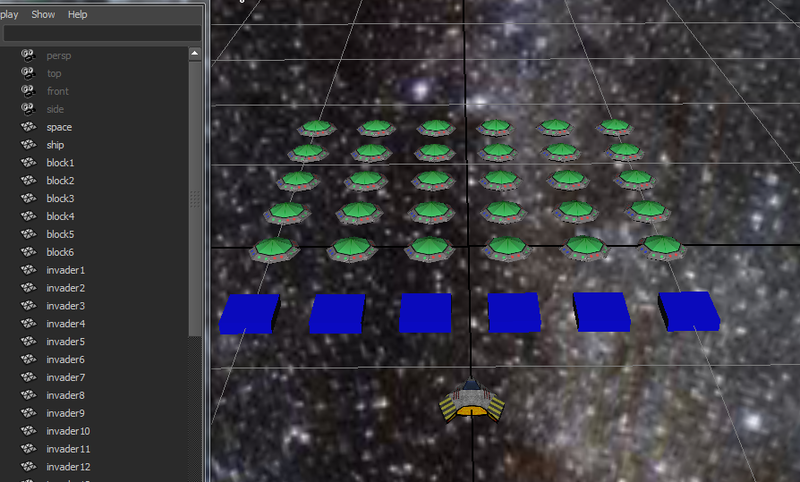 Note that the grid spacing I used in the modeling application is 5 units. Here's what we changed: First we fetch the invaders model, just like before. As we've seen earlier this contains all models including their name we had in the modeling application. These are stored in the nodes. So we iterate over the nodes and fetch the name (id) of each node. Then we create a ModelInstance using the model and id as arguments, just like we did earlier. On the next line we fetch the node from the instance, which is basically a copy of the node within the model. Next we set the transformation of the ModelInstance to the transformation of the node. Practically this reads the transformation (like rotation and translation) we set earlier within the modeling application. Then we need to reset the node's transformation, because we now use the ModelInstance transform. For translation this is (0,0,0), for scale this is (1,1,1) and for rotation we set the quaternion to identity. This is followed by a call to calculateTransforms() to make sure the ModelInstance is updated with these new values. Now that we have the ModelInstance just like it was in the modeling application, we need to add it to our scene. If the id is space, we simply assign the space ModelInstance and continue, because we manually render that. Otherwise we add it to the instances array, so it gets properly rendered. Finally we check the id if it starts with either "ship", "block" or "invader" and accordingly assign the ship ModelInstance or add it to the appropriate Array. Let's run it and see that it is exactly the same as we had before. But instead, now we have fully designed our scene in the modeling application, making it a lot easier to design.